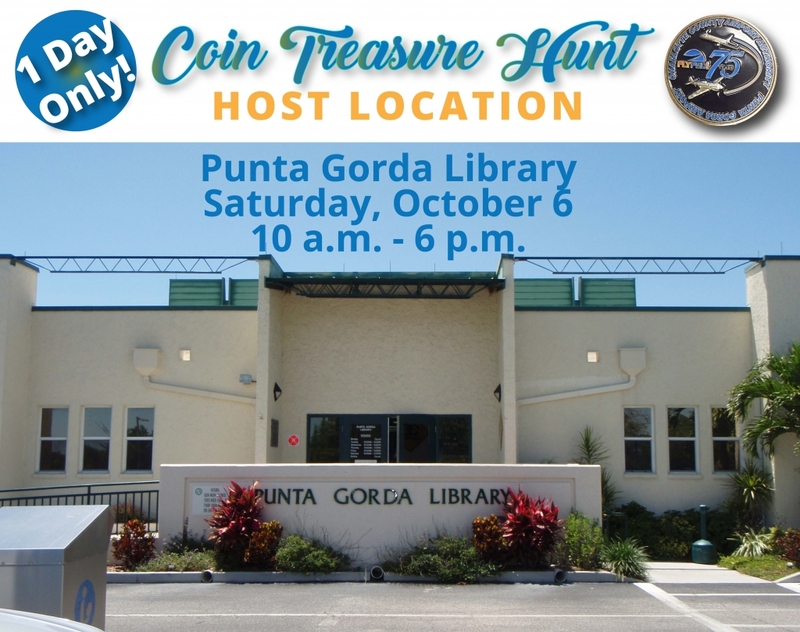 Punta Gorda, FL (October 1, 2018) – Local residents and visitors are encouraged to participate in PGD’s 75th Anniversary Coin Treasure Hunt Contest being held online and at hidden locations in Charlotte County Oct. 1-10, 2018. Participants can submit entries to win travel getaways at www.FlyPGD.com/contest. PGD is commemorating the activation of the Punta Gorda Army Airfield in 1943 – which was key to training pilots for oversees duty and contributed to the victory in World War II. One grand prize winner will receive a one-day Key West Getaway for five guests; an Air Trek air charter valued at $2,000. The Key West Getaway includes continental breakfast, one-hour flight in Air Trek’s pressurized Cessna 414 for up to five passengers, a tour of Key West, and champagne served on a sunset flight home later the same day. Three additional winners will each receive a $250 Travel Voucher from Allegiant Air. Four additional winners will each receive a Family 4-Pack to the Florida International Air Show. Various other winners will win PGD-branded stainless-steel canteens, hats, shirts and more merchandise. 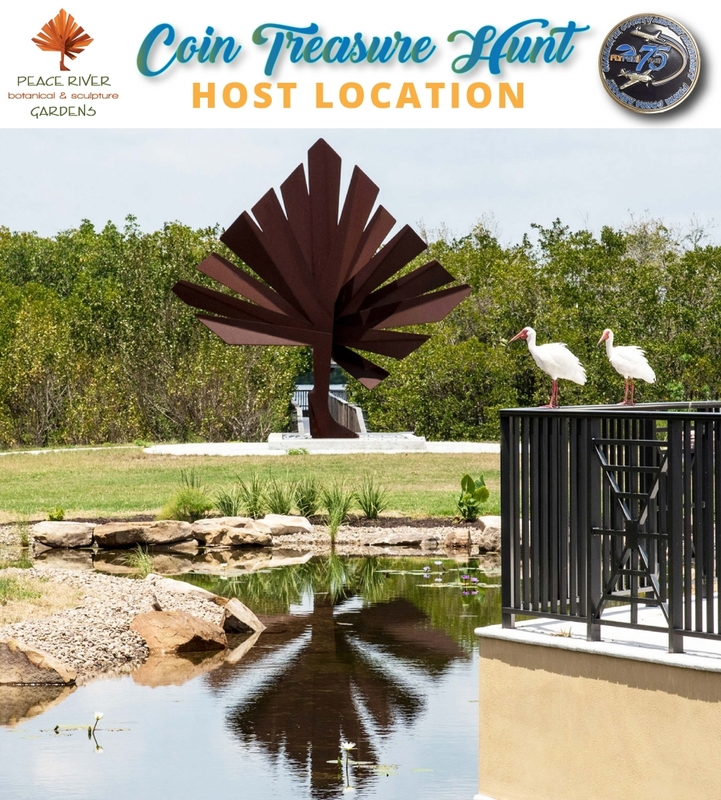 Participants are encouraged to join the hunt for up to 25 commemorative PGD coins that will be hidden at various Charlotte County locations from Murdock to Punta Gorda throughout the 10-day contest period. While any adult over 18 can enter to win online, participants who find a commemorative PGD coin and submit their photo entry online at www.FlyPGD.com/contest will be assigned and additional nine chances, totaling 10 chances, to win one of the prizes. Photos of the participants that find coins and submit their entries online will be shared on PGD’s website and social media channels. The winner(s) will be selected via random number generator and contacted on or about October 15, 2018. Winners must be physically present with verifiable identification to pick up the prize at PGD’s administrative offices during regular office hours October 15 – 18, 2018. Well-trafficked or public areas where the existing property owner is not aware of the coin’s presence. Coins will be hidden at undisclosed indoor and outdoor locations in Charlotte County throughout the Oct. 1-10 period. Host Locations; A limited number of local businesses and organizations may also host the contest at their location by hiding a coin on site or hosting an associated promotion at their discretion. 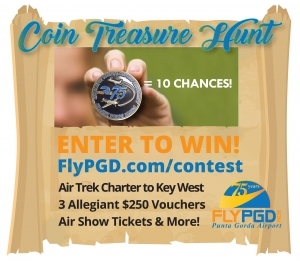 Employees of PGD, Charlotte County Airport Authority and Host Location(s), their immediate families (parent, child, sibling or spouse) and/or household members and any other persons or entities associated with the contest, are not eligible to locate and enter one of the hidden coins in the Contest. For the latest clues & finds, visit our Facebook timeline & photos. The Punta Gorda Library is one of our one-day-only Host Locations that has provided a clue for their assigned coin. CLUE: Search our catalog for your “Destination” on Saturday, October 6 from 10 a.m. – 6 p.m. 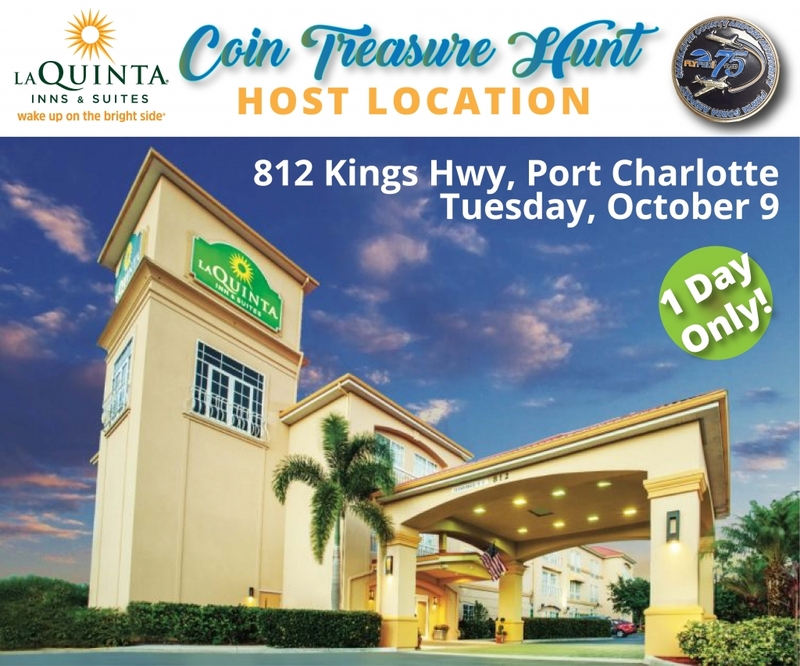 The La Quinta Inn & Suites in Port Charlotte is one of our one-day-only Host Locations that will provide a clue for their assigned coin on Tuesday, October 9. The hunt will start at 9 a.m. on Tuesday, so stay tuned! 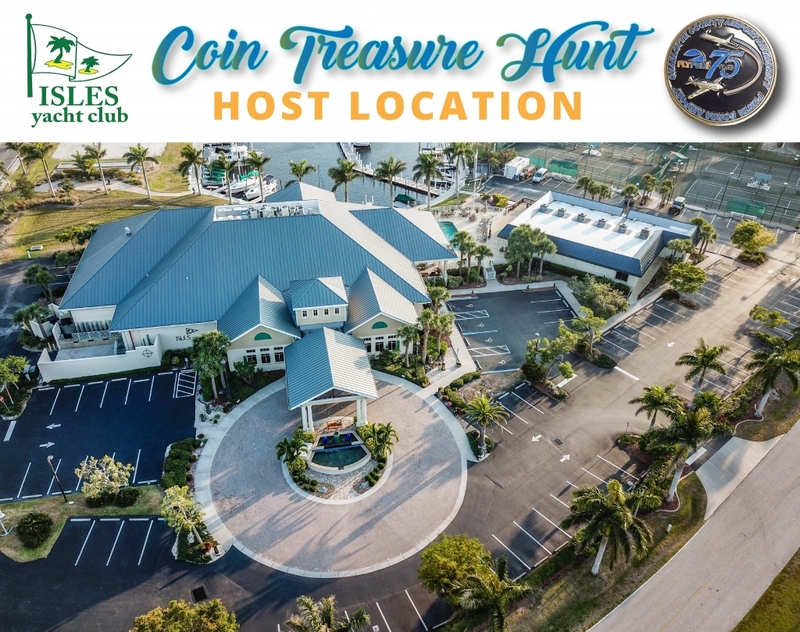 The Isles Yacht Club is one of our Host Locations that will draw a winner for their assigned coin. To enter to win the IYC coin (one of 25 total), just visit their office Monday through Friday from 9 a.m. – 5 p.m. and answer a quick trivia question.